An Upper West Side treasure offering children’s gymnastics, dance, preschool, sports, karate, music, art, early childhood classes, for NYC kids for over forty years. Discovery is dedicated to providing creative, nurturing and meaningful experiences that allow children to grow as active learners while engaging the entire family. Sign up today and experience for yourself our great teachers and inspirational programs that generations of families have loved and remember. For children who want something a little different than what traditional team sports and martial arts have to offer, Parkour for Kids at Discovery Programs is the way to go! Discovery is not just for girls! Gymnastics, sports and gym, and junior sports. 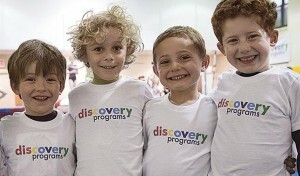 Discovery Summer Camps – Registration Now Open! March Spring Break Holiday Camp! Eli Lifton has been practicing Seido Karate with Sensei Karin at Discovery since he was six years old. He’s currently in sixth grade and has just earned his Junior Black Belt..
Coach Denise has been at Discovery Programs for two and a half years. She started coaching recreational gymnastics classes and now, in addition to recreational gym, she also coaches team and Parkour!..